The flower casts a shadow, the rhinoceros kicks up dust; a tracery of thin veins appear just under the delicate skin of one petal, sharp thorns sprout from another sturdy stem. When people see Madiha Sikandar’s work for the first time, her first challenge often lies in convincing them it’s not ‘real’ – “I can’t seem to push my viewer beyond that sometimes,” she confesses. Employing the traditional archival style known as ‘gadrang’ she paints using squirrel hair and pigeon feather brushes dipped in pigments made from substances like gum Arabic and chalk. While her artistry lies in her obvious skill as a miniature painter, it is also in the politically charged themes she embraces, from violence and tribalism to displacement. However, in the modest 3 piece set she exhibited at the Colombo Art Biennale, her choice of canvas was meant to be as intriguing as her art. 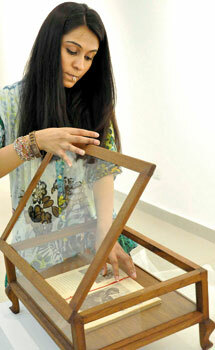 You could call Madiha a desecrator of books, though what she does might just as easily be considered consecrating them. 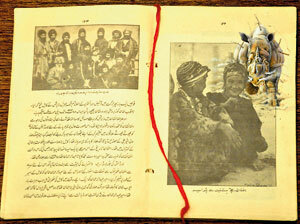 The Pakistani artist likes to “situate” her drawings on the pages of old tomes. She explains that the still lives she draws in books are meant to evoke in the viewer the sense of “a coincidental finding, like something you forget and you return to much later.” She chooses the exact page to place them on by focusing on the one whose text is most resonant. “Sometimes it can take me months to resolve a work mentally,” she says. All this deliberation isn’t born out of a scarcity of raw material. Madiha would visit the Sunday Bazaar in Karachi if she wanted to find a secondhand novel, but she rarely needs to look further than the bookshelves that line her studio. She is uninterested in anything fresh off the presses, in fact it’s an absolute essential that her books be pre-owned. 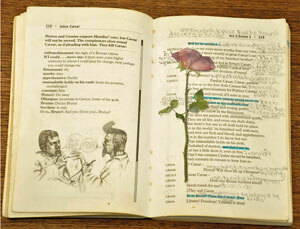 Her fascination is with those in which people have written dedications, jotted down notes or doodled in the margins. Graduating with a distinction from the National College of Arts, Lahore, Madiha specialised in Mughal Miniature painting. Now, in keeping with the tradition in which she was trained, she is all about precision and life like detail – artistic skills that her mother thought would make her a perfect plastic surgeon. “A plastic surgeon needs a steady hand,” she was told as a six year old. Her family is crowded with medical practitioners, and Madiha remains more than a little amazed at the turn her own career has taken. “I have no idea how I got to where I am now,” she says, “but the truth is that I have never wanted to be anything other than an artist.” When she first began drawing, her work for her served as “an intimate and personal dialogue” – tellingly, when it came to her Master’s thesis she chose to use her family’s history as her theme. Having been uprooted during the tumult that surrounded Indian independence, they moved first to Bangladesh and then to Pakistan after the 1971 war. Published in the Sunday Times, Sri Lanka on February 26, 2012. Words by Smriti Daniel. Pix by Susantha Liyanage. Tags: Pakistani Miniature Painter Madiha Sikandar Says Her Work is Inescapably Political. Bookmark the permalink.